Another week, another #Forzathon event and one that includes some special finds! This week Playground Games is giving you the chance to snag a couple brand new Barn Find Rumors which should, hopefully, equate into a pair of fancy new exotic or classic rides. If the picture above is any indication, it looks like one of them will be a classic Porsche. 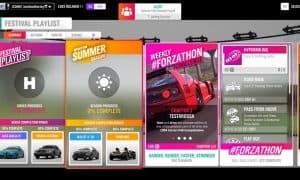 The FH3 #Forzathon March 30-April 5th event gives you a chance to pick up the usual Credits, XP, and Wheelspins as a couple of new Barn Find Rumors for some new rides. In case you missed the update a few weeks ago, it’s also playable in 4K 30fps glory after the recent Xbox One X Enhanced patch for all you Xbox One X owners out there. 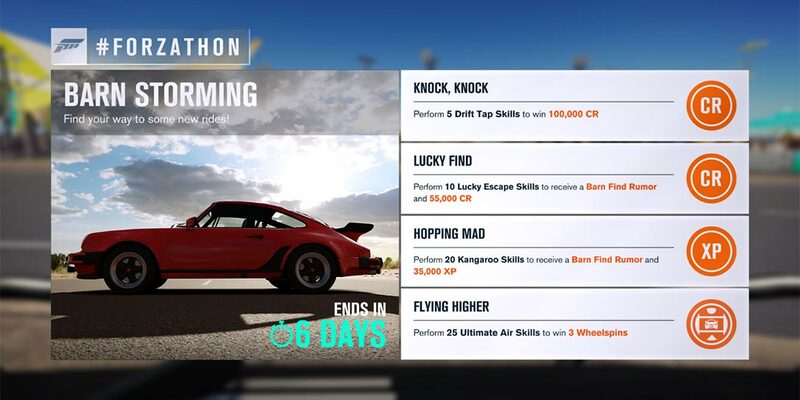 This FH3 #Forzathon event started today, March 30th, at 12:01 a.m. PT and closes at 11:59 pm PT on April 5th so you have until the wee hours of April 6th (depending on your time zone) in order to complete the challenges. First off… Drift Taps. Uggh. To perform a Drift Tap, you have to hit a rail or another solid object while drifting — but you have to do it lightly enough that you don’t wreck your skill chain. Ultimate Air Skills are pretty easy, just head to the dunes south of the airport and launch your car over the vehicle 25 times to score those 3 Wheelspins. Now for the best part of this week’s #Forzathon — new Barn Find Rumors! In case you haven’t played much, there are a few barns hidden around the map that you find through Barn Find Rumors that are unlocked as you progress through the game. It’s been quite a while since we’ve seen new Barn Find Rumors… so here goes. You can probably get your Kangaroo Skills in at the same time as your Ultimate Air Skills as they require you perform three Air skills in quick succession. If you haven’t finished up there, you can head over to Redstone Gold Mine or Pink Lakes as well to finish up quick. Get 20 of those and you’ll get one Barn Find. Lucky Escapes are back again after taking a week off. The Lucky Escape skills can be a bit tricky but are done by performing a Drift skill followed by a Near Miss skill. The easiest place to do this, in my opinion, is speeding up and down the highway. Get 10 of these and there’s your second Barn Find Rumor. 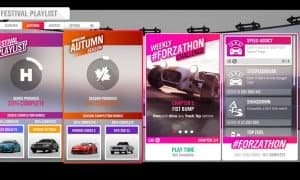 What do you think about the “Barn Storming” FH3 #Forzathon event and the new Barn Find Rumors? 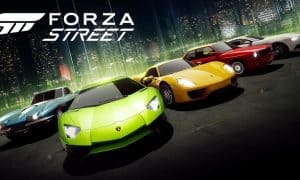 Are you still playing Forza Horizon 3 on a regular basis or has your focus shifted to Forza Motorsport 7? Let us know in the comments below or on Google+, Twitter, or Facebook.